Research* from CIS Excellence Awards Patisserie Chef of the Year sponsor, Callebaut, has revealed that a significant percentage of people are prepared to pay more when dining out. While 75% of consumers are willing to spend more to celebrate a special occasion, 94% would be likely to return to an establishment that has made them feel special. 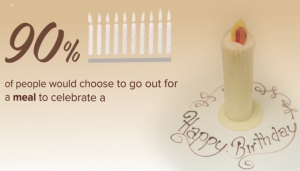 Birthdays and anniversaries are also key, with 90% and 63% of people, respectively, preferring to eat out. Robert Harrison, Sales Director, Gourmet, for Callebaut Northern Europe, said: ‘The fact that consumers are willing to splash out when celebrating special occasions means that operators are able to boost profits by offering something extra special. ‘Desserts present a key opportunity for operators, with 78% of consumers admitting they would be more likely to treat themselves on a special occasion, and two-thirds claiming they would be more likely to order a chocolate dessert. To help chefs harness this demand, Callebaut’s development chef, Julie Sharp, has created a series of videos aimed at demonstrating recipes, techniques and simple tips. Entitled ‘Ten Ways To Make It Special’, they include practical guidance, inspiration and techniques to help enhance desserts throughout the year. Featured along with an animated infographic (pictured above) highlighting the key research findings, the videos are available at www.fortheloveofchoc.com. Callebaut has been making chocolate in the heart of Belgium for over 100 years and is chocolate of choice for confectioners, pastry chefs and chocolatiers all over the world.